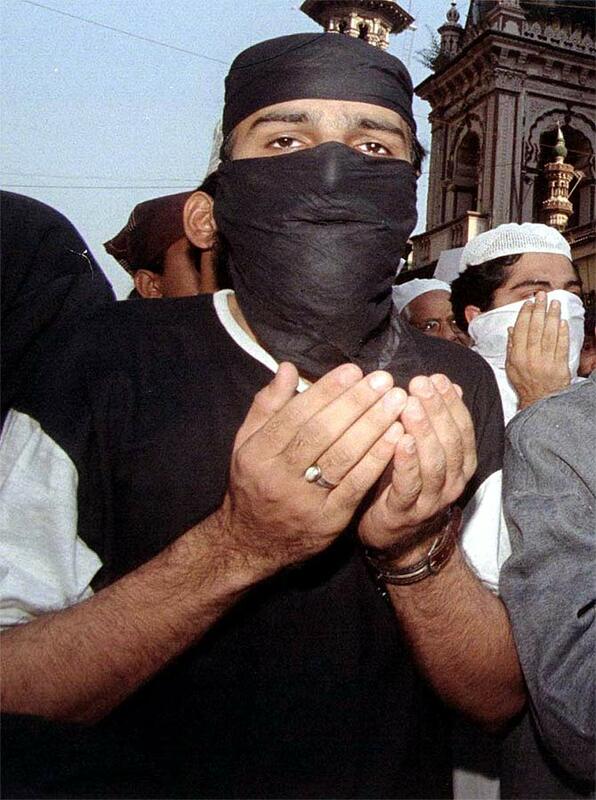 No lessons learnt from Babri incident? Uttar Pradesh appears to be, once again, turning into the centre-stage for the murky drama of communal politics. This brand of politics had touched its nadir with the demolition of the Babri Masjid in Ayodhya in December 1992 and the ensuing communal flare-up across the country. In fact, the political build-up to the Black Sunday of December 6, 1992 -- the day the Babri Masjid was brought down -- brought both the Bharatiya Janata Party and the Samajwadi Party to the forefront. Right from its inception, the BJP had grown essentially on the strength of its politics of Hindutva. The Babri incident made Samajwadi Party supremo Mulayam Singh Yadav realise the increasing influence of religion on the minds of the voters. Though his initial rise in Uttar Pradesh was attributable to the need for change -- the need to break the shackles of a prolonged and discredited Congress rule -- it was the support of Muslim voters that took him to new heights. Even today, when the nation stands at the threshold of the 2014 Lok Sabha elections, Mulayam is clearly all set to play up the Muslim card. So what if that amounts to handing over an opportunity -- to exploit the emotive spirit of Hindutva -- on a platter to sworn rival BJP? A series of events in the past have led to the common perception that the visible rivalry between the BJP and the SP was actually more of posturing -- essentially aimed at polarising their respective vote banks of Hindus and Muslims. Now, when political experts are predicting a hung Parliament after the Lok Sabha election, Mulayam sees it as a major, and perhaps the last, opportunity to fulfill his long-cherished dream of reaching the prime minister's chair. And he knows that it will not be possible without the en bloc support of 21 per cent of voters in UP, who happen to be Muslims. 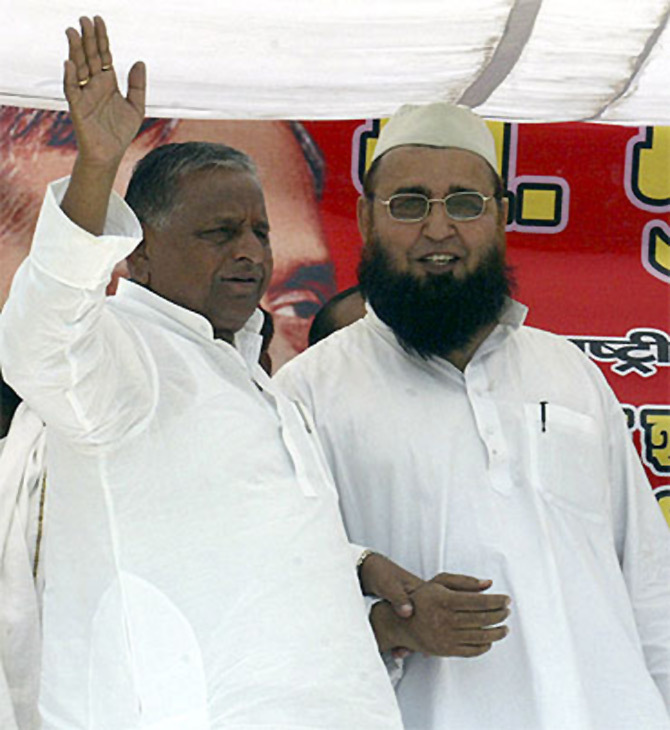 After all, in a caste-ridden and religion-guided voting scenario, Muslim voters alone can help SP win half of UP's 80 Lok Sabha seats, giving Mulayam more bargaining power in a possible Third Front coalition. Did Mulayam ink a secret deal with the VHP? Guided by desperation, Mulayam seemed to be going blatantly overboard to impress upon Muslims that he alone was their true messiah. He did not hesitate to even strike underhand deals with his otherwise sworn adversaries in the saffron brigade, if that served his ultimate goal. What was the BJP's interest in playing along with Mulayam? Well, a Muslim tilt towards the SP would automatically weaken the Congress in its competition with the BJP in the ultimate race for power in New Delhi. This posturing was exposed when battle lines were purportedly drawn between the Vishwa Hindu Parishad and the Samajwadi Party over the 84-kosi parikrama yatra near Ayodhya from August 25. 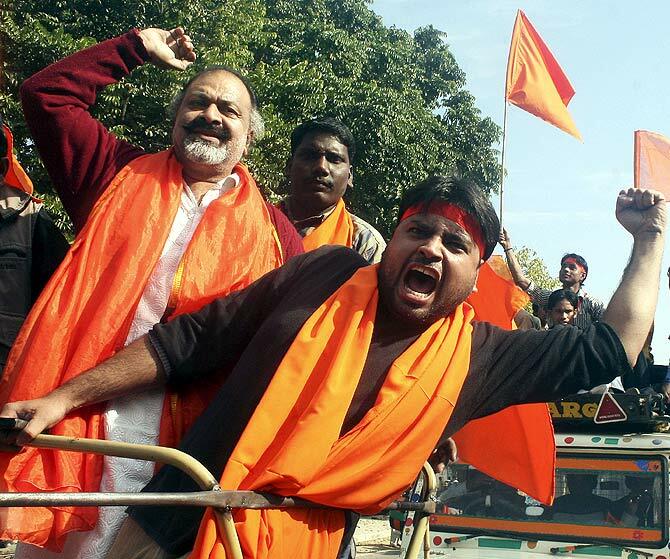 The VHP neither had the intention nor the capability to undertake such a yatra, while the SP regime, which declared a vociferous ban on the parikrama, was actually keen to see the parishad pushing its plan aggressively. Critics aptly termed the event as one of 'match-fixing' between VHP chief Ashok Singhal and SP supremo Mulayam Singh Yadav and his son and Chief Minister Akhilesh Yadav, as the three had remained closeted for two hours, just before the VHP gave its call for the parikrama and the SP government issued the ban order . 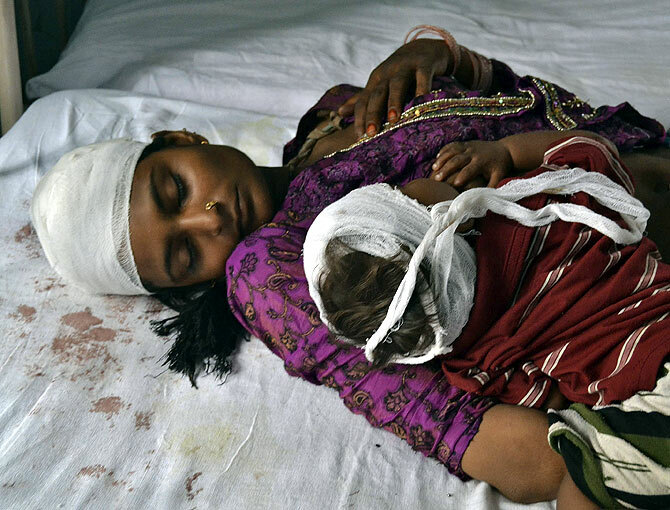 The communal violence which broke out in large parts of Muzaffarnagar district and then spread to neighbouring villages in the surrounding districts of Saharanpur, Meerut, Baghpat and Shamli took nearly 50 lives -- the official toll is 38 -- over a span of just 48 hours. While UP has witnessed over 30 major and minor incidents of communal violence since Akhilesh Yadav assumed power in March 2012, a communal riot of such a large magnitude broke out in the state after nearly two decades. Ironically, Mulayam still had the cheek to publicly pat his son on the back and proclaim, "The Akhikesh government deserves praise for controlling the situation in just two days". The action by the state government reportedly followed a prolonged spell of passive 'wait and watch' approach. The inactive administration, in fact, allowed an incident of eve-teasing to snowball into one of the worst communal riots in recent memory. Widely recognised as a key hub of western UP -- often referred to as the state's 'wild west' region -- Muzaffarnagar and its neighbouring areas are infamous for their firm belief in settling personal scores with the power of the barrel. Here, personal disputes get settled with muscle power and gun power, not by the law of the land. A social scientist, on condition of anonymity, aptly described western UP as a land where "gender bias is so blatant that women are treated with open contempt, centuries-old social inequalities reign supreme and the law of the land is of no consequence." How did the riots start? On August 27, when two young Jat boys went over to confront a Muslim boy in Kawaal village of Muzaffarnagar for allegedly teasing a girl, all three boys were killed. The policemen chose to look the other way, even though the nearest police post was less than a km away from the site of the violence. The scores were settled in a manner typical of the 'wild west'. But the one-sided manner in which action was initiated by the local authorities, who chose to book a large number of Jats for the crime, gave the BJP an excuse to perpetuate its own politics of religion. And before the new police and administration officials could even get their bearings, the Jats rose up in arms to convene a maha panchayat to lodge their protest on August 31, but the event failed to attract too many people. The Jat community soon gave a call for a bigger show of strength, with another panchayat on September 7. Other than clamping Section 144, which bars the assembly of four or more people in any public place, the state administration did nothing to douse the simmering rage. In fact, no effort was made to prevent the assembly of thousands of people at the venue. The BJP found this an ideal occasion to emerge as messiahs of the Jats and a huge band of party leaders, led by veteran leader Hukum Singh, converged at the event. "Not only did the statements issued by local authorities to the media explicitly say that there was no restriction on anyone to attend the maha panchayat, none of the several police pickets en route to the venue stopped me or even cared to question me while I was on my way to the panchayat,” Hukum Singh told this scribe after being charged with violating Section 144. Criminal cases were also registered against BJP leaders Suresh Rana and Sangeet Som, Congress Member of Legislative Assembly Harendra Malik and Bharatiya Kisan Union leaders Rajesh Tikait and Naresh Tikait for making inflammatory speeches intended to arouse communal passions and foment trouble. Hukum Singh alleged, "These two panchayats were convened after we saw Muslims staging a major demonstration in Muzaffarnagar town on August 29 -- in gross violation of the provisions of Section 144 -- with men brandishing sharp weapons at the gathering. Pictures of the gathering, with demonstrators carrying weapons, were carried by some leading dailies but the administration preferred to turn a blind eye”. By the evening of September 7, 11 people had been killed, including TV channel IBN-7’s Muzaffarnagar correspondent Rajesh Verma and local photographer Israr Vakil . While Rajesh was shot dead in the cross-fire between the two communities, Israr was abducted by a mob, carried to Sakheda village and lynched to death after he tried to escape.The brutal killing took place barely 100 metres from the local police station. A full-scale war soon erupted between the two communities and spread like wild fire -- not just in Muzaffarnagar town but also in the neighbouring villages. The state government promptly called in the army, a tacit admission that it had failed to handle the situation. But then, in all communally sensitive situations in India, members of the Muslim community always feel more secure with the army around than they do with khakhi-clad policemen. Homes were attacked, shops were torched and properties were burnt, compelling Muslims to flee Jat-dominated villages and Jats to look for safer havens away from Muslim-dominated villages. "This was unprecedented as rioting had rarely spread into the rural pockets, where Jats and Muslims have been known to co-exist in harmony," pointed out a senior IPS officer who had completed a successful stint as the district police chief of Muzaffarnagar. The situation worsened even though state Director General of Police Devraj Nagar had set up base in Muzaffarnagar. His second-in-command, Additional Director General, Law and Order, Arun Kumar, who had been repatriated by the Union home ministry for alleged mishandling the Arushi murder case, was flown to Muzaffarnagar to take command of the deteriorating situation. Kumar failed to make any difference in the riot-hit region, other than touring the affected areas in a 20-vehicle long motorcade. But not only did the violence continue, it even spread further, compelling Kumar to admit before TV cameras, "No one can guarantee that there would be no more violence." More incidents of shoot-outs and stabbings were reported from new areas as rioters continued to go on a free run. Back in Lucknow, Mulayam Singh Yadav called the shots via 1990 batch IAS officer Anita Singh, who, despite being just one of the several secretaries to the chief minister, is better known as one of the five "de facto chief ministers". Rather late in the day, after 36 innocent lives had been lost and communal riots had spread to four neighbouring districts, the government decided to wake up from its studied slumber. A major shake-up was carried out in the police administrations of Muzaffarnagar, Saharanpur as well as Shamli. District police chiefs, deputy inspector generals, zonal inspector generals as well as the commissioner were given marching orders. The licenses of nearly 1,900 firearm owners were cancelled and a crackdown was ordered on the mischief-mongers. As many as 700 people were arrested overnight, while less than 200 arrests had been made in the 12 preceding days. While blaming the entire violence on the BJP, UP Chief Minister Akhilesh Yadav said, "A minor scuffle between two individuals has been blown up into a riot simply because it was fuelled further by BJP leaders. Such incidents do occur sometimes, but currently these small incidents are being used to serve the communal ends of political parties like the BJP, who have nothing else to bank upon at a time when general elections are not far away." He added, "Earlier, such incidents were treated like routine crimes and dealt with accordingly, but the BJP used it to communalise the atmosphere so that it could win the votes of Jats in the region." Akhilesh sought to also pass the buck to Bahujan Samaj Party, whose leaders Swami Prasad Maurya and Naseemuddin Siddiqui had sought the dismissal of the Akhilesh government over, "the complete breakdown of law and order." Maurya and Siddiqui also urged state Governor B L Joshi to recommend the imposition of President’' Rule in the state. Meanwhile, in his report sent to the Union government, Governor Joshi has squarely blamed the Akhilesh government for the rioting. According to a highly-placed source, "The governor has said that the state government failed to take stern and timely action when the issue was simply limited to an isolated incident of eve-teasing." The report reportedly observed, "The large-scale violence that followed ten days after the August 27 incident could have been avoided if firm action had initially been taken by the state government." Political analysts believe that the governor's report was aimed at serving the Congress party's interests and keeping Mulayam on tenterhooks. 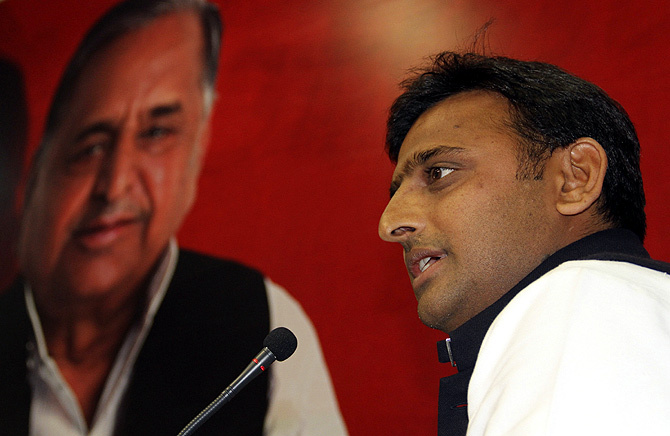 They pointed out that the Congress has begun to view the SP as a major threat to its own aspirations for Muslim votes. Meanwhile, in an obvious bid to soothe ruffled feathers, Akhilesh hastily appointed a one-man judicial commission to inquire into the riots, headed by retired high court Judge Vishnu Sahai. But those hit by the riots do not expect much from the commission's report, which is expected to be released in two months, given Sahai's widely known proximity to Mulayam. After Prime Minister Manmohan Singh, Congress president Sonia Gandhi and Vice President Rahul Gandhi's highly-publicised visit to Muzaffarnagar, Akhilesh planned a hurried trip to Muzaffarnagar -- ten days after the riots actually broke out. But the only measure he could take was the suspension of the senior superintendent of police, who had already been shunted out, and doling out monetary sops like Rs 10 lakh (later raised to Rs 15 lakh) to the next of kin of the victims. He even promised jobs to family members of the victims, while Dr Singh and Gandhi had laid stress on ensuring that terrorised families, who were still holed up in relief camps, could return home. In this race for Muslim votes between the SP and the Congress, the BJP is making hay -- paving the way for polarisation of the Hindu vote which is crucial to the saffron brigade.